In the gospel according to La La Land jazz is a dying art. Last night’s show at The Cockpit Theatre in Marylebone proved otherwise. Jazz in The Round does what it says on the tin. The band sets up in the middle surrounded by four sides of audience creating an intimate and immersive atmosphere. The evening was hosted by Chris Philips and Jez Nelson from Jazz FM who were recording it for broadcast. Support came from Esquivo led by young guitarist Fabrizio Brusca. It’s a pan-European band with Italian, Greek and German members. The music features rolling dissonant modal chords with vocal-led melodies reminiscent of Pat Metheny’s earlier work. Soloing was often collective and sometimes featured Balkan or free jazz influences. 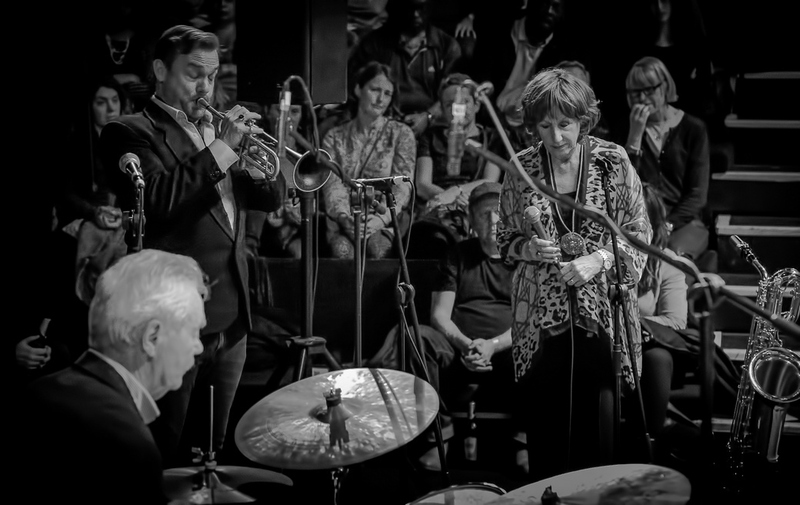 It was a bit self-conscious ‘Euro’ jazz but made a great hors d’oeuvre for the main event, a tribute to cult trumpeter and singer Chet Baker featuring one of British jazz’s most loved vocalists and former Kenny Wheeler collaborator, Norma Winstone. She is one of the world’s great interpreters of song and a most musicianly improviser so we were in for a treat. In 1983 Norma’s pianist John Horler backed Chet Baker at Covent Garden’s long lamented The Canteen supper club with his trio. Bassist Jim Richardson took the opportunity to record the show on cassette and it has just been released as an album “Chet Baker Live in London” on Ubuntu Music. 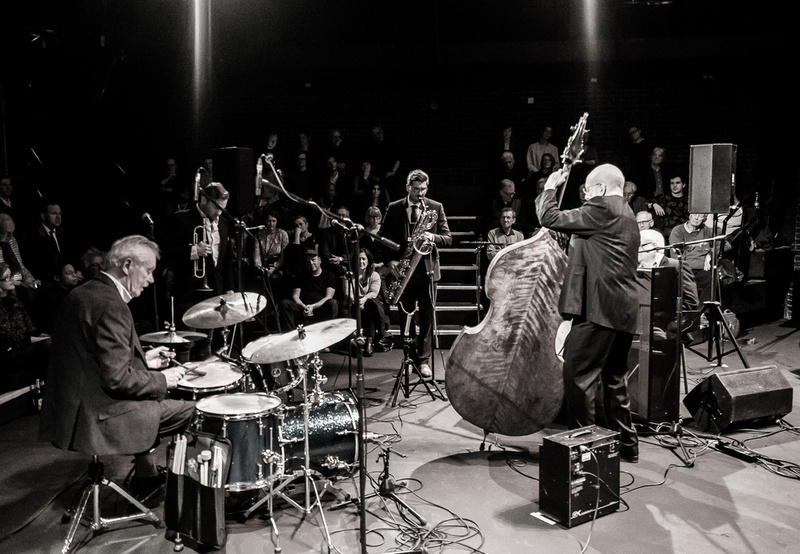 The band has reformed to create this tribute to Chet and alongside Norma, Jim and John features Quentin Collins on Trumpet/Flugelhorn, Leo Richardson on Saxes and Tony Mann on Drums. Highlights of the show included Norma’s peerless scatting on ‘Just Friends’, an emotional reworking of the Chet Baker classic ‘My Funny Valentine’ and the contrapuntal complexity of ‘Line for Lyons’, a Gerry Mulligan composition from Chet’s piano-less quartet with the baritone sax giant. Ending with a buoyant rendition of ‘It Could Happen To You’. It was a real delight to hear Norma going back to her roots singing standards and to hear these great musicians swinging hard. 27 March 2017 – Matthew Bourne Synthesizer Show Following on from the success of his stunning 2016 album release, Moogmemory this is bound to be a wild show from a fearlessly unpredictable keysman. 24 April 2017 – Sun Ra Appreciation featuring Gilles Peterson A special line up recreating classic music from Saturn plus rarities from the record shelves of collector Gilles Peterson, who will be playing cuts from some of his favourite Sun Ra LPs on vinyl. The Cockpit is well worth a visit – it’s a great space to listen to music and the programming is progressive and exciting so go and support live creative musicians and prove La La Land wrong!